using property ShowHeader in LMDDockPanel is not working. I need to show / hide the header caprion on specific panel. Just checked and the feature working fine. Can you describe issue in more details. May be you have some specific setup? Also, you can send simple demo app to our support e-mail. you are right is working except on center panel. And why if I remove the center panel after I can't add again? > you are right is working except on center panel. Center panel, known as "space zone" show document tabs, not panel headers. If you do not need "space zone" you can turn off the feature using Site.UseSpace property. However, this will change other aspects as well. > And why if I remove the center panel after I can't add again? 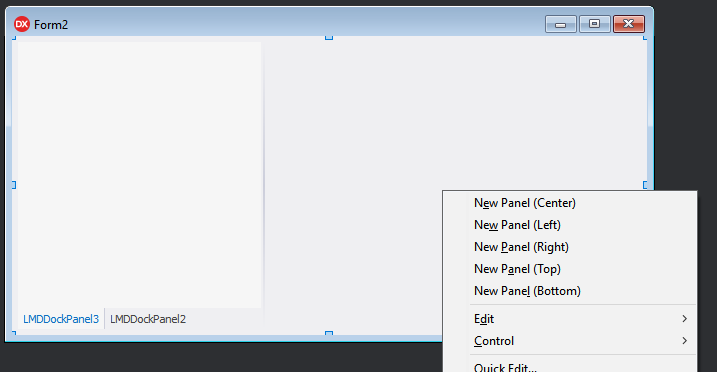 Without panel header you will not be able to start drag-drop process. Hiding of panel headers is more a feature for panels on the site, when they are not allowed to be dragged from. "why if I remove the center panel after I can't add again?" and I can't add again.